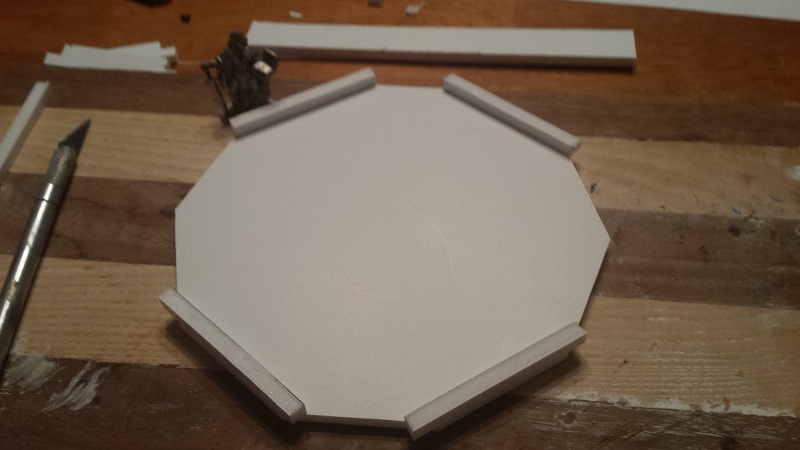 It's time to start on my first major terrain piece for Frostgrave. 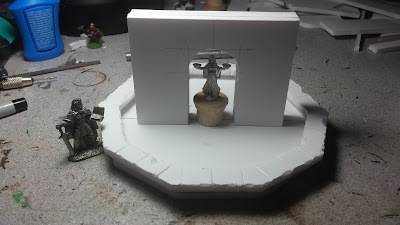 Inspired by the Well of Dreams and Sorrows scenario, I decided to make a fountain using a Reaper miniature as the center piece. The goal is to have it look like it's thawing out and mix the water effects with some crackle paint in places to make it look like the ice is breaking up and floating. Lots of progress has been made on it, already. I wasn't sure how I was going to create the round ring for the main pool area. After awhile I decided that a polygon of some kind was the better way to go. So, I started by using graph paper to draw an octagon. But I didn't like how it turned out. 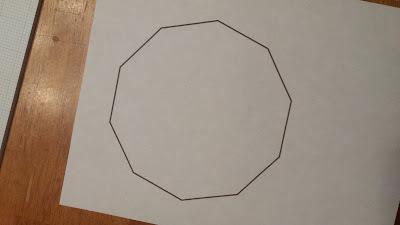 Then I started trying to draw an decagon, but my geometry skills are rusty and I wasn't getting a proper symetrical decagon with hand drawing. Enter Illustrator and my printer and instead of wasting 30 minutes redrawing the decagon to get it right, I had one the proper size and printed in two minutes. 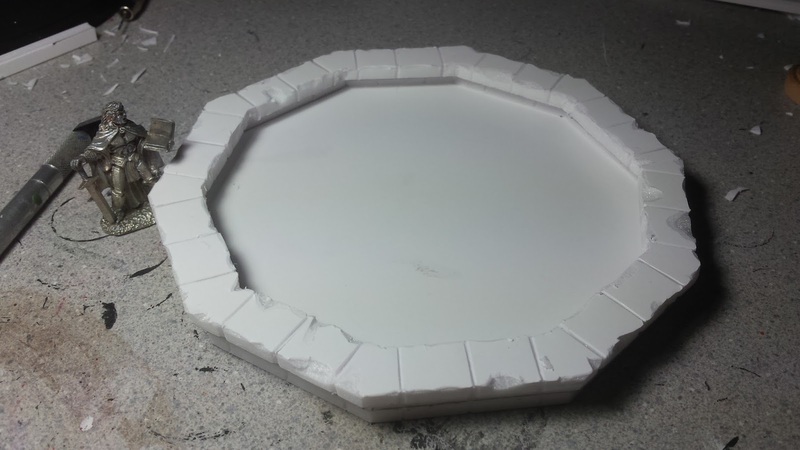 This was then transferred to some foam core board and cut out to give my the base of the fountain. Here I had a couple issues deciding how the walls of the pool should be attached. I started off by making a 1/2" tall wall that I would cut to size and wrap around the outside edge. But this turned out to be sub-optimal. 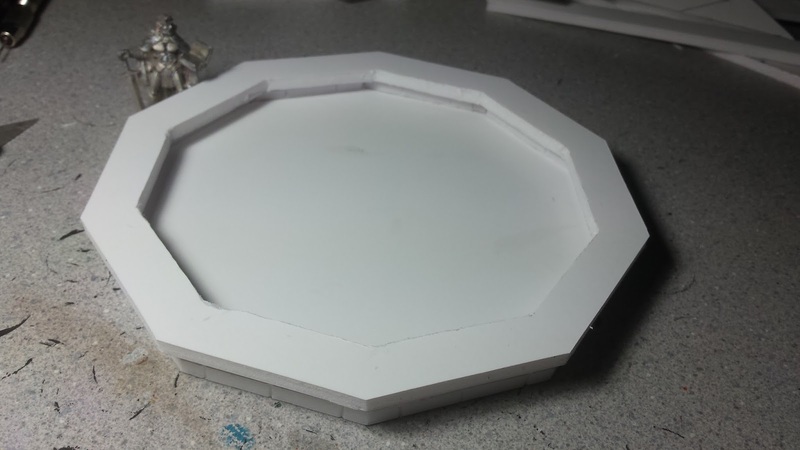 Then, I realized that I would just put a strip along the time, and use the edges of the foam core as the bricks. So I started cutting strips of foam core and gluing them on top of the base. Once they were all in place and dry, I started cutting into the edge of them with my x-acto blade to create the look of brickwork. I started with the top layer and used the natural seams of the strips as edges of bricks and then added some lines in the middle. Then I followed the pattern on the base layer and then cut the tops and insides of the top wall section. the rim. 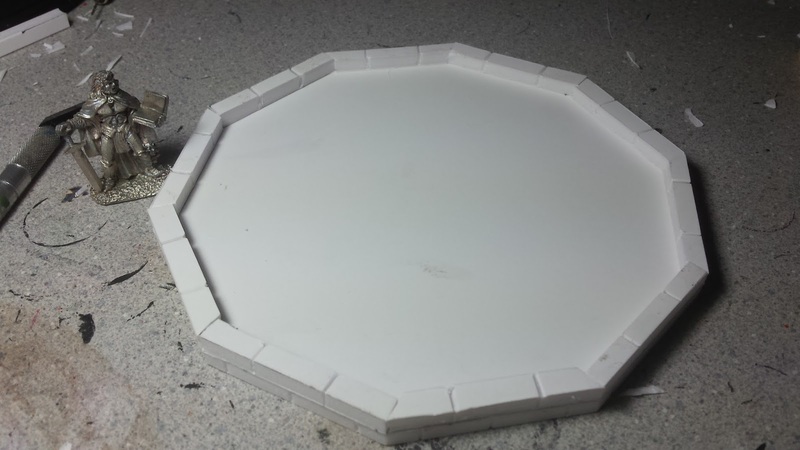 The rim was made by taking the same pattern for my decagon, adding an 1/8" to the outer edge and 3/8" to the inside. This allowed for and 1/8" over hang on both sides of the pool edge. After a bit more sculpting, I had more brickwork done for the rim, giving it the look of work and chipped masonry. Libra, the mini for the fountain is on the left. That finished off the base section of the fountain. 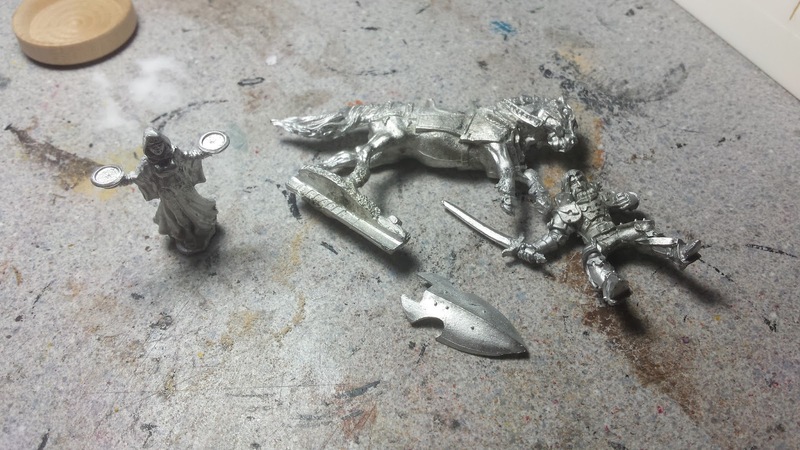 But I needed the statue miniature to continue. Luckily, that arrived the next day. When I picked up the foam core board, I also got a few different wooden parts to use as statue stands. I cut one of the spools in half and glued a disc to the top. 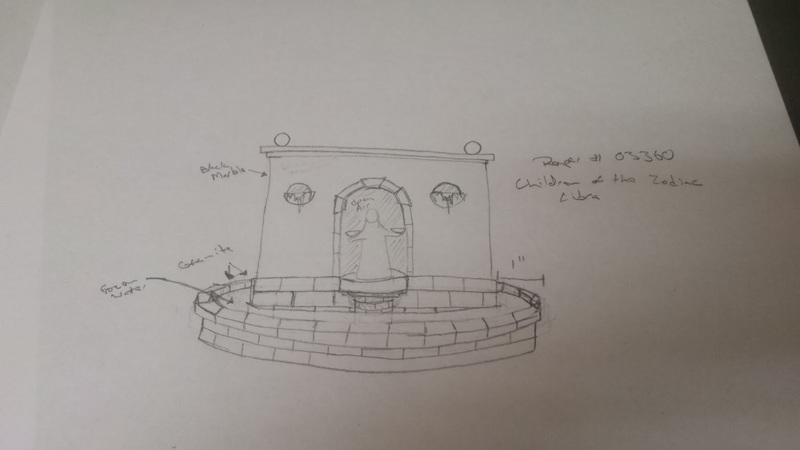 Then with the mini in hand I could measure out the centerpiece of the fountain. core to add thickness to it. With the main structure built, now it's time too build the waterfall spouts and add details to it. Its looking like I'll need to sculpt 4 identical spouts by hand... which it not my strong suit. So it looks like I'll be looking up some how-to videos on working with milliput for sculpting. Either way, it's turning out well so far. There is a long way to go yet.